LONDON, Feb. 01 /CSRwire/ - Jam Muhammad Saleem is a smallholder cotton farmer who lives near the village Jhangar Marha, in the remote, rural district of Muzaffargarh, in Pakistan’s Punjab province. When his eldest son, Muhammad Umar, turned 12, Saleem — considering Umar old enough to work — saw no choice but for him to leave school to work on their farm. But just a year later, Saleem’s outlook changed completely. The reason? 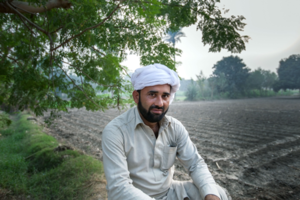 After participating in BCI Decent Work training sessions implemented by our on-the-ground partner, WWF-Pakistan, Saleem’s perceptions about the importance of children’s education, including his son’s, shifted for good. Defined by the International Labour Organization (ILO) as work that provides opportunities for people to work productively in conditions of freedom, equity, security and human dignity, Decent Work is central to achieving a BCI licence. A key component of BCI’s Decent Work training is eliminating child labour, particularly where children are involved in heavy or hazardous tasks, such as working with dangerous tools or applying pesticides. Jam Muhammad Saleem’s story is not unique. By 2020, we will train 5 million farmers worldwide on more sustainable agricultural practices. — BCI Farmer Jam Muhammad Saleem. Jhangar Marha, Muzaffargarh, Pakistan, 2018. The Better Cotton Initiative (BCI) — a global not-for-profit organisation — is the largest cotton sustainability programme in the world. Last year, together with our partners we provided training on more sustainable agricultural practices to 1.6 million farmers from 23 countries. We are truly a joint effort, encompassing organisations all the way from farms to fashion and textile brands to civil society organisations, driving the cotton sector towards sustainability. Thanks to the support of partners and members, Better Cotton accounts for around 19% of global cotton production, and by the end of 2020, we aim to train 5 million farmers worldwide on more sustainable agricultural practices and ensure that Better Cotton accounts for 30% of global cotton production.